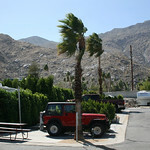 April 2009 - Palm Springs, California -- We spent the entire month of April in Palm Springs. We thought it would be a perfect time, but at least in 2009, we had major issues with weather. It was windy (50 MPH +) or super hot (100 deg +). There were some nice days in between though. During the month, Joe and I went 4-wheeling in our Jeep at Pinkham Canyon which goes from BLM land into Joshua Tree National Park. Then our friend Jim Kunkler arrived by train and spent the last week with us and rode with us home, via the annual South County Men's Retreat in Arroyo Grande. While Jim was there, he, Jeff, who lives in Palm Springs, and I took the aerial tramway to the top of San Jacinto mountain which was a lot of fun.